I. Introduction to Inversion Theory. 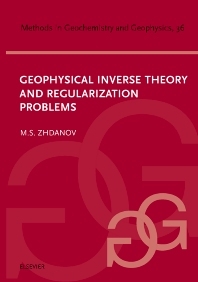 Forward and inverse problems in geophysics. 1.1 Formulation of forward and inverse problems for different geophysical fields. 1.2 Existence and uniqueness of the inverse problem solutions. 1.3 Instability of the inverse problem solution. Ill-posed problems and the methods of their solution. 2.1 Sensitivity and resolution of geophysical methods. 2.2 Formulation of well-posed and ill-posed problems. 2.3 Foundations of regularization methods of inverse problem solution. 2.4 Family of stabilizing functionals. 2.5 Definition of the regularization parameter. II. Methods of the Solution of Inverse Problems. Linear discrete inverse problems. 3.1 Linear least-squares inversion. 3.2 Solution of the purely under determined problem. 3.3 Weighted least-squares method. 3.4 Applying the principles of probability theory to a linear inverse problem. 3.5 Regularization methods. 3.6 The Backus-Gilbert method. Iterative solutions of the linear inverse problem. 4.1 Linear operator equations and their solution by iterative methods. 4.2 A generalized minimal residual method. 4.3 The regularization method in a linear inverse problem solution. Nonlinear inversion technique. 5.1 Gradient-type methods. 5.2 Regularized gradient-type methods in the solution of nonlinear inverse problems. 5.3 Regularized solution of a nonlinear discrete inverse problem. 5.4 Conjugate gradient re-weighted optimization.III. Geopotential Field Inversion. Integral representations in forward modeling of gravity and magnetic fields. 6.1 Basic equations for gravity and magnetic fields. 6.2 Integral representations of potential fields based on the theory of functions of a complex variable. Integral representations in inversion of gravity and magnetic data. 7.1 Gradient methods of gravity inversion. 7.2 Gravity field migration. 7.3 Gradient methods of magnetic anomaly inversion. 7.4 Numerical methods in forward and inverse modeling.IV. Electromagnetic Inversion. Foundations of electromagnetic theory. 8.1 Electromagnetic field equations. 8.2 Electromagnetic energy flow. 8.3 Uniqueness of the solution of electromagnetic field equations. 8.4 Electromagnetic Green's tensors. Integral representations in electromagnetic forward modeling. 9.1 Integral equation method. 9.2 Family of linear and nonlinear integral approximations of the electromagnetic field. 9.3 Linear and non-linear approximations of higher orders. 9.4 Integral representations in numerical dressing. Integral representations in electromagnetic inversion. 10.1 Linear inversion methods. 10.2 Nonlinear inversion. 10.3 Quasi-linear inversion. 10.4 Quasi-analytical inversion. 10.5 Magnetotelluric (MT) data inversion. Electromagnetic migration imaging. 11.1 Electromagnetic migration in the frequency domain. 11.2 Electromagnetic migration in the time domain. Differential methods in electromagnetic modeling and inversion. 12.1 Electromagnetic modeling as a boundary-value problem. 12.2 Finite difference approximation of the boundary-value problem. 12.3 Finite element solution of boundary-value problems. 12.4 Inversion based on differential methods. V. Seismic Inversion. Wavefield equations. 13.1 Basic equations of elastic waves. 13.2 Green's functions for wavefield equations. 13.3 Kirchhoff integral formula and its analogs. 13.4 Uniqueness of the solution of the wavefield equations. Integral representations in wavefield theory. 14.1 Integral equation method in acoustic wavefield analysis. 14.2 Integral approximations of the acoustic wavefield. 14.3 Method of integral equations in vector wavefield analysis. 14.4 Integral approximations of the vector wavefield. Integral representations in wavefield inversion. 15.1 Linear inversion methods. 15.2 Quasi-linear inversion. 15.3 Nonlinear inversion. 15.4 Principles of wavefield migration. 15.5 Elastic field inversion. A. Functional spaces of geophysical models and data. A.1 Euclidean space. A.2 Metric space. A.3 Linear vector spaces. A.4 Hilbert spaces. A.5 Complex Euclidean and Hilbert spaces. A.6 Examples of linear vector spaces. B. Operators in the spaces of models and data. B.1 Operators in functional spaces. B.2 Linear operators. B.3 Inverse operators. B.4 Some approximation problems in the Hilbert spaces of geophysical data. B.5 Gram - Schmidt orthogonalization process. C. Functionals in the spaces of geophysical models. C.1 Functionals and their norms. C.2 Riesz representation theorem. C.3 Functional representation of geophysical data and an inverse problem. D. Linear operators and functionals revisited. D.1 Adjoint operators. D.2 Differentiation of operators and functionals. D.3 Concepts for variational calculus. E. Some formulae and rules from matrix algebra. E.1 Some formulae and rules of operation on matrices. E.2 Eigenvalues and eigenvectors. E.3 Spectral decomposition of a symmetric matrix. E.4 Singular value decomposition (SVD). E.5 The spectral Lanczos decomposition method. F. Some formulae and rules from tensor calculus. F.1 Some formulae and rules of operation on tensor functions. F.2 Tensor statements of the Gauss and Green's formulae. F.3 Green's tensor and vector formulae for Lamé and Laplace operators. Bibliography. Index.